In mid-January I was fortunate to travel to Malaysia and the United Arab Emirates. Travelling with an eye being trained in the professions of the built environment means that it’s virtually impossible not to notice the more intricate things that occur in cities. And as such, I have noticed things in both Kuala Lumpur and Dubai that have piqued my interest, spawned ideas and initiated further inquiry into why these cities have been designed the way they are, and how this is influencing, and is influenced by, the social strata inhabiting these magnificent metropolises. In particular, this piece will be concerning itself with Dubai. Dubai has fascinated me for some time. I witnessed its rise over the years, both from transit stop-overs and through the news. In many ways, it represents a microcosm of today’s society: an urbanised, unremitting devotion to building things, and using building as a means of communicating power. It’s not something new to our societies; many empires, kingdoms and states have used infrastructure to convey prowess. But I don’t think many have done so on the scale that Dubai is doing today. Dubai is indeed a city of contrasts. The old and the new are juxtaposed at almost every street corner: Arabic tradition contrasted with the surge of (mainly Western) tourism, souks competing for space with pristine shopping malls, and traditional dhows sailing right next to the sheikhs’ million-dollar yachts. But it is also a city of contradictions: things that are perceived as impossible to exist are built almost effortlessly. Islands shaped like palms stretch into the Persian gulf; skyscrapers claw at the desert skyline, their foundations anchored into sand that should just not be able to keep them in place; the green spaces are just too green, and water is desalinated just to maintain these artificial gardens in the desert oasis-emirate. Dubai’s rise can be attributed to a number of factors. Firstly, its global positioning: it’s located almost directly in the centre of the world. Its airline, Emirates (one of the largest airlines in the world) operates a dynamic hub that connects the emirate to the entire globe. It makes it a perfect central point from which travellers can see the world – in this way, the city becomes a gateway to planet Earth. Economically, this is brilliant: investment in Dubai is centralised, and the movements of the world’s cultures converge at this particular city, engaging with each other, learning, exploring, and then propagating that new-found knowledge back into the rest of the world. The sad reality of Dubai, however, is that these beautiful, oasis-like offerings are built by workers who will never truly get to enjoy them. That’s the premise of Dubai’s great plan: import labour, get astounding projects constructed, and then discard the organic tools of progress. You’re not invited to overstay your welcome. You’re to build, then leave. The infrastructure is there primarily for the emirati, and then maybe for the tourists as well. Democracy? Forget about it. Some question the very need for such ostentatious things as palm-shaped islands, incredibly tall buildings and artificial green parks. There is indeed an aura within Dubai of striving to be the world’s best, the world’s first… the city is a space of superlative. And sadly, in order to execute such things, the quickest way for this city seems to be the import of cheap labour from India and the Far East. Surely there must be an alternative? I think the future development of Dubai rests on sustainable construction: building not just incredible structures, but livelihoods; incorporating the workers as part of the city’s society, and thus transcending the clear-cut class distinction apparent right now. Despite this, one cannot deny the ingenuity present in this city. The unremitting devotion to progress, the tenacious ambition of its ruler Sheikh Mohammed bin Rashid Al-Maktoum, has terraformed a desert into a hub of economic activity. As I walked the streets of Bur Dubai, and looked across the creek to the soaring towers, I was reminded of Rome: a city at the centre of a vast empire; a city built on ambition. The vast numbers of themed shopping malls harkens to the Forums of ancient Rome: nodes of convergence, spaces for trade, meeting and leisure. Monuments built by the ruler tower over the city – the Amphitheatrum Flavium in Rome, the Burj Khalifa, Burj al-Arab and Emirates Towers in Dubai – reminding us of the might of the sovereign and the ambition fuelling the city’s rise. 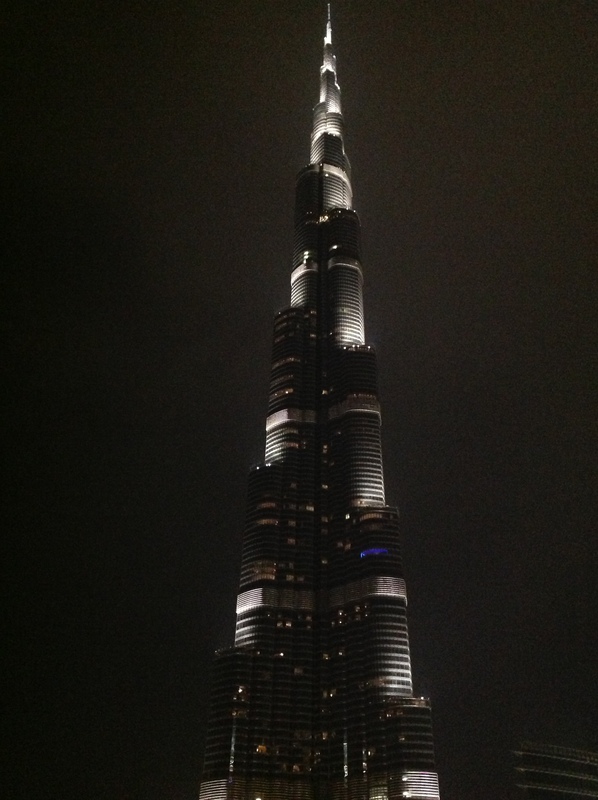 The world’s tallest building, Burj Khalifa, as seen from the ground at Dubai Mall. Viaducts snake between buildings, retreat underground, and shoot out from futuristic-looking stations, carrying high speed trains, not unlike the beautiful aqueducts that enabled the Empire to surge to unprecedented greatness. Engineering is everywhere in Dubai, whether it’s visible, like the new Metro, or quietly maintaining the structural equilibrium that the tallest building in the world demands of this region. Dubai becomes a playground for the architect, the place where ideas can be tested in public, and not be frowned upon. Crazy designs, new shapes, forms unprecedented in architecture, can easily be found on the murky horizon. And yet more structures are being built as cranes compete for space amongst the concrete and steel that forms Dubai’s skyline. The question, however, is the necessity for such buildings. Dubai’s relentless building programme was significantly implicated during the world economic collapse a few years ago, but the city is slowly regaining its dominance in the construction sector. The fact remains, though: does the city functionally need so many tall buildings, when most of them lie empty? Driving down large highways, it’s hard not to spot a tall building without a “For Sale/Spaces to Let” sign draped across its beautifully crafted façade. I was truly impressed by the Dubai Metro. This marvel of urban engineering is something that many established cities today are striving for; Dubai has almost perfected it. Elegant trains, sleek stations, functional spaces and precise schedules connect citizens to the city. If there’s one thing a municipal delegation from another country can take back from a tour of this city, it should be the way Dubai Metro operates. Two lines are already operational – the Red and Green lines – and a third is already being built. The “engineering testing bed” that is the entire city of Dubai is a fascinating aspect of the metropolis. Contemplating the Arabian city in this way allows one to see through the “tourist façade” and understand Dubai’s importance in terms of the built environment: that the work being executed here has massive implications globally in the architectural and engineering spectrum. There’s no question that Dubai is at the forefront of the global built environment landscape. It is an investment hub, a gateway to the world and an opening into the Middle East. Whilst its bigger brother, the capital Abu Dhabi, is also furiously building, Dubai, for now, remains the centrepoint of modern architectural marvel in the UAE, and perhaps the region. Whilst this growth comes at the price of thousands of migrant workers toiling away for the benefit not of themselves, but of the emirati that employ them, the city will indeed be undergoing some form of social change, perhaps soon, that will radically shift this. Dubai is a fascinating city, and one that I look forward to watching as it continues to build, usher in new generations of urban thinkers, and push the boundaries of modern engineering. Poem written at the entrance to the world’s tallest building. A small example of this city’s ambition to rise over the world. A very well written and balanced article. Dubai has come a long way in a short period of time. Adrian Smith (the main architect behind the Burj Khalifa) is a brilliant architect. I hear that he is designing an even bigger tower that will be built in Saudi Arabia. It’s planned name is The King Tower. These oil rich nations have have a lot of capital that can be invested into awe-inspiring projects such as those taking place in the UAE, Qatar and elsewhere. We just have to hope that these nations do not continue developing at the expense of their people and that they start becoming more democratic, equal and transparent. We are already seeing unrest in that region due to lack of representation, corruption and inequality (Bahrain, Syria, Lybia, Egypt etc.). The last thing that we would want is to see these ambitious projects put on hold or even cancelled. Thanks, Aron. I agree, the capital is bountiful in these regions, particularly due to the natural resources. But again, whilst these projects are ambitious, and we as tourists and admirers enjoy looking at these incredible structures, the question does arise: how necessary are these buildings, when there’s such a challenge to even occupy them? I think developers like Emaar (devs. of Burj Khalifa) need to take stock of the demand/supply, and design/develop/build accordingly. Reblogged this on NR Architects & Associates.